I finally got my own version of this classic fan photo! After all the research (Part 1), and all the travel decisions (Part 2), it’s finally time to head down to San Diego Comic-Con! In order to beat LA traffic and avoid paying for an additional night at the hotel, we were on the road by 4:45 AM on Thursday. Let me tell you, I am NOT a morning person, but the prospect of a fun road trip (and Starbucks) always gets me out of bed. If you are driving and don’t mind an absurdly long day, I’d highly recommend leaving early – we hit zero traffic, and pulled into the hotel parking lot at 6:55 AM. Luckily, we were not the only bleary-eyed Con goers in the lobby, and the hotel kindly allowed us to store our luggage and perishables in their air-conditioned storage. Since we decided to bring food with us that needed to be refrigerated, we packed everything into a soft insulated ice chest bag and layered all of our available reusable ice packs in and around the food. This worked well for our purposes and everything stayed cold, but if your hotel won’t accommodate your storage needs or you’re worried, you may want to find a grocery story close to your hotel and pick up your necessities. I also confirmed ahead of time that our room came with a mini fridge and our small 16 oz bottles of milk, yogurt, and miscellaneous snacks fit quite nicely. After dropping off the luggage, my next goal was to get our badges in hand. Thanks to my research, I knew this was potentially one of the most difficult tasks to accomplish, so after getting the car parked in our designated shady-looking parking lot, we hopped on the bus at 7:30 and finally got our first look at the convention center. I knew it would be busy, but the insanity of seeing the cosplayers with their massive getups was unreal. Arriving at the center early was key; even though the doors to the exhibit hall weren’t open yet, badge pickup was buzzing with activity. We did a first-rate job of proving our noob-ness by asking twenty people directions, and repeatedly getting turned around. However, the volunteers were incredibly patient and finally got us where we needed to go. That’s one thing we experienced throughout the weekend – the volunteers were courteous, patient and more often than not the verbal targets of frustrated fans. My only complaint with their implementation was that communication from the event organizers was absolutely horrible, and as a result the volunteers were often as clueless as the fans. With badge pickup complete, we killed some time at a nearby hotel lobby and ran into a few people we know. I would recommend checking out the hotels in the area as many of them have a variety of events happening, many of which are free to attendees. By the time we returned to the convention center, the crowds had increased exponentially, and there were lines going every which way. Since we had “professional” badges (more info about badge types here), we were told we could enter at separate doors than where the main crowd had to go. In hindsight, we should have gone with the crowd as we kept getting directed to different doors, and ultimately ended up at one of the “C” doors that had stopped letting people in moments before we got there. This led to a mob forming outside the door, with one of the poor volunteers being inundated with questions about why people weren’t being admitted. Eventually the staff started admitting people, but only after half an hour of standing in almost 90 degree heat with one person even fainting. It was a bit eye-opening to see how aggressive people can get, and I now have a new appreciation for my personal space. Once we were on the exhibit floor, it was nearly impossible for Mr. P² and I to stay together as people kept walking into us, knocking his hand off my shoulder, or stopping the flow of traffic altogether. Mr. P² and I learned some valuable lessons during this experience, one of which is that we much prefer finding “smaller” panels and parking our rears for the day. After the chaos of the exhibit floor, it was so nice to go sit and watch a panel presentation about a variety of topics. This is also where having snacks comes in handy since we could break out the beef jerky and bananas without losing our seats (or money). Something I highly recommend is reading about all the panels in the various materials provided by SDCC organizers, and planning accordingly. On Thursday, I had read about a panel celebrating the anniversary release of Stanley Kubrick’s 2001: A Space Odyssey. Since Mr. P² is a fan of both the films and the books, I wanted to make sure we were there. I also knew ahead of time that panel rooms are not cleared out after each panel, so fans can stay in one room all day if they want. Therefore, we ended up in the designated 2001 room sitting through a panel about the new WWE wrestling action figures being released next year. Not our cup of tea, but the panelists were entertaining and we got great seats for the 2001 presentation by being in there ahead of time. After the 2001 panel and checking out the DC Universe experience at the Hilton, we were exhausted, thirsty and hungry. 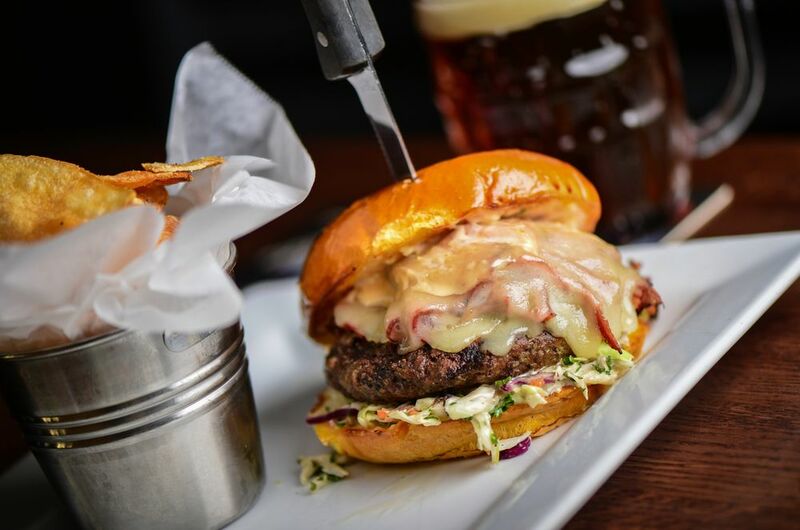 Although we had dinner reservations at a different restaurant, we took one look at the menu at Cold Beers & Cheeseburgers in the Gaslamp District and ate there for dinner all three days. My only disappointment here was that they (and most likely other establishments) didn’t honor their Yelp check-in discount during SDCC. That’s all for this post, I don’t want to make it too long of a read! Feel free to drop any comments or questions below, I want to hear your stories – the good, bad and ugly!